Note: the following study presents exciting new research identifying the descendants of the ancient lost house of Israel. It has tremendous bearing on Bible prophecy, the fulfillment of the covenants, and the duties and obligations of God’s chosen people in the world today. Ashe states that Anglo-Israel (sometimes called British-Israel) believers “do not claim that the British people are the lost tribes because of the legends and alleged linguistic coincidences which are cited in support of that view. Their starting-point is the Bible, read in a fundamentalist spirit.” Mr. Ashe is correct in that observation; Christians who uphold the Bible as the Word of God base their belief upon it. Their starting-point is the Bible! But we are confident that historical proofs such as archaeology and linguistics will also verify the Scriptural record. For those who do not find Bible prophecies alone convincing, we present proof of language links in this study. The author continues, “The prophets foretell various things about Israel which have not been fulfilled in the Jews: that God’s people will be powerful, that they will be ‘a nation and a company of nations,’ and so forth. Also, a few passages (notably Ezekiel 36:15-25) certainly seem to keep up the distinction between Israel and Judah after the exile of both, and to foreshadow a final return and reunion... The British-Israelite, or any other theorist who thinks on these lines, feels no obligation to produce scholarly proofs that the lost tribes exist. He already knows that they do because, on biblical grounds, they must. Their reality is an axiom, not a conclusion. His non-Biblical arguments are offered mainly as indications confirming the belief he already holds.” These are key points: The lost tribes of Israel must continue to be in existence as a separate people somewhere, even though they have not yet been identified; there will be a final reunion with Judah at the end of the age. Further, the Jewish people have not fulfilled all of the prophecies given to Israel, so we must look elsewhere to find these prophecies fulfilled. But in which people? Having answered this from Bible prophecy in a separate tract, we are now addressing it through linguistics, the study of languages. Having said this, however, Mr. Ashe closes with a caveat: “But while a case could be made out for the Empire being Israel in some symbolic sense, the case for literal ethnic links with the lost tribes could not be sustained. It was altogether too complicated... [it] reduces the lost tribes to a theme of speculation only.” This statement is best answered by analogy. If a robbery or murder occurred, would we accept a police explanation that, ‘there is a solution here, but we won’t try to solve it because it is altogether too complicated’? Of course not! Where lives are at stake, a solution is necessary. In a Spiritual sense, lives are indeed at stake, who can be transformed by a knowledge that the Bible is true and the prophecies fulfilled. A mystery is a subject for “speculation” only until the solution is found, and we believe that the identity of the lost tribes of Israel is now proven, as we shall show. Since Mr. Ashe believes that a solution is “altogether too complicated,” we will simplify our answer to two basic principles of linguistics, the science of languages. “Guttural” consonants “Kh”, hard “G”, and hard “C” are interchangeable. Vowels are very frequently interchanged, added, or substituted. This interchangeability of hard consonants was also true in ancient Mesopotamia. In the Assyrian Cuneiform Alphabet, the same character stands for both the hard “G” and “Kh,” as can be seen in the box at left.3 A moments’ reflection will indicate to you that the same part of the mouth and throat is used to sound out all three hard consonants: Kh, hard G, and hard C, and that a change of spelling is easily and logically made from one to another, because virtually no change in pronunciation is involved. This is verified by modern Hebrew language and literature scholar, Dr. Isaac Elchanan Mozeson, who teaches language studies at Yeshiva University in Jerusalem. He states, “The Hebrew G, the Gimel, is often a K in Greek and other Western tongues. [The Hebrew letter G] resembles a backwards K.”4 As an example, Mozeson gives the word, “colossus,” which originated as “Golios,” the Hebrew word for the Biblical giant, Goliath. He states, “The Greek pronunciation would sound like “kol-ios” - just as the [Hebrew word for camel], Gamal, was rendered “kamelos.”5 Note again the interchanges between the K, G, and C.
We will be applying this interesting principle shortly in connecting several seemingly unrelated ancient tribes. Nineteenth-century scholar, Sir William Betham (1779-1853), was knighted by the King of England for his research into ancient history, language, and archaeology. He had this to say concerning vowels in ancient languages: “Vowels are often substituted for each other: the same words are written promiscuously with an a, o, and u, an e or an i.”6 As an example, he discussed the ancient inhabitants of western Britain, “the Welsh, who have ever called themselves by the name of Cymri, Cimbri, or Cumbri.”7 As can be easily seen, the name of this ancient tribe has been variously spelled with differing vowels: Y (often called a “pseudo-vowel”), I, and U. Such variations are a good example of the common vowel shifts which are found in the name of this historic people, who we will learn more of shortly. Another scholar of renown was Dr. Richard Cumberland (1632-1718), Anglican Bishop of England in the early 17th century. He authored several celebrated books, and was well regarded in his day for his expertise in ancient history and languages. He wrote, “The learned will not wonder at change of vowels in a name, especially when its made by authors of different countries and times, because they know this is a thing very usual; yet for the service of readers that are not much used to such changes, I will give proof thereof. “Wherefore, I have observed, that in Jeremiah 48:23, our translation calls a place in Moab, Beth Meon, which signifies the house or temple of Meon, agreeably to the Hebrew text and to the Chaldee paraphrase. But the Septuagint calls it the house of Maon; and so doth the vulgar Latin. The Moabites agreed with the Egyptians in their idolatry, who worshipped their first king and planter as a god, under the name of Osiris. But when they speak of him as a man who first reigned among them, they call him Meon or Menes, with a Greek termination: Which word, Bochart well observes, signifies habitations or places to dwell in, which he brought them to and settled them in.” Samuel Bochart (1599-1667) was a well-known Huguenot scholar. On the subject of vowels, Dr. Isaac Mozeson states, “The Bible has no vowel marks in the original, handwritten parchment form.”9 Similarly, Professor Cyrus H. Gordon, who is perhaps the leading American archaeologist of the twentieth century, stated concerning a Hebrew Old Testament name, “The ancient Hebrew text... has only the consonants...which were later supplied with vowels to make a verbal noun of it.”10 It is true that some Semitic languages, such as Hebrew, originally contained no written vowels at all, but only consonants, with the vowels supplied by the reader. The drawback to this is obvious: Different speakers might use different vowels, creating a slightly different pronunciation of the same words. As an example, the name of God in Hebrew consisted of the four consonantal characters, YHVH, and is therefore called the tetragramation, meaning “four letters.” Centuries later, a scholarly argument is raging concerning whether the name of God was originally pronounced Yahweh, Yahvee, Yahvah, or something similar. The solution may perhaps never be known, because of the absence of vowels in ancient written Hebrew. Indeed, it is possible that more than one pronunciation was in use in ancient times, due to the absence of stated vowels to guide the speaker. Repetition of consonants, as seen in the second and third names above, was also a common occurrence. Therefore, by the grammatical rules governing language, all four tribes must be one and the same people. Who were they? Let’s examine them one at a time. When the conquering armies of the nation of Assyria came against the ten-tribe kingdom of the house of Israel late in the eighth century, B.C., they did not refer to God’s People as “Israel” or “Jews.” Instead, the Assyrian word for them was, “Khumri.” This has been established through the deciphering of Assyrian “cuneiform” clay tablets. Ancient historian, Alan Ralph Millard, in his recent book, “Treasures from Bible Times,” says, “In 1846 men working for Henry Layard on the site of the ancient Assyrian city of Calah (Nimrud) uncovered a block of polished black stone, carved and inscribed. The ‘Black Obelisk’ records the triumphs of the Assyrian king, Shalmaneser... The first panel in the second line of pictures proved exciting. The text above the kneeling figure lists tribute brought to the king from ‘Yaua son of [Khumri]’ that is, Jehu, who took the throne from a descendant of Omri, king of Israel.”11 Millard reproduces the Assyrian words mentioning Israel, along with a literal translation. So the first mysterious tribe of our ancient list, the Khumri or Gomri, are definitely identified by ancient inscriptions as Israelites of the so-called, “lost ten tribes,” who disappeared from history in the Caspian Sea region of Medo-Persia during the late 8th century and early 7th century, B.C. It is fascinating that the Gimirrai suddenly appeared out of seeming nowhere in the same century as the lost tribes of Israel disappeared, yet no scholar ventures to investigate a link between them. The additional mention of “Iranian” (i.e., Medo-Persian) words in the Gimirrai vocabulary indicates some physical contact between the Gimirrai and Medo-Persians, such as the captive Israelites might have been expected to have had. Historian Sharon Turner, in fact, stated that he identified 262 Medo-Persian loan-words in the Anglo-Saxon-Cimmerian vocabulary.16 Who were these mysterious people? 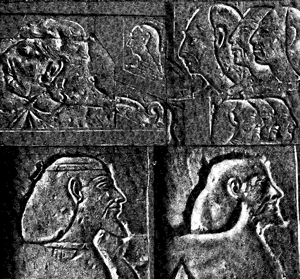 According to scholars, the Gimirrai, Gomer, Cimbri, Teutons, and Celts are all linked together as the same people. By applying the rules of language, we realize that the “Gimirrai” were also the same people as the “Khumri,” who have been positively identified as Israelites of the lost ten tribes. It is therefore no coincidence that the lost tribes of Israel disappeared in Medo-Persia-Iran (II Kings 17:6), the birthplace of the Gimirrai. The same Encyclopedia Britannica article has this to say about the people known today as Cimmerians: “An ancient people of the far north or west of Europe, first spoken of by Homer (Odyssey, xi. 12-19), who describes them as living in perpetual darkness. Herodotus (iv. 11-13), in his account of Scythia, regards them as the early inhabitants of South Russia (after whom the Bosporus Cimmerius and other places were named. )”17 The same encyclopedia reference also traces the European “Cymry” and “Celts” to this same people. There seems to be no question in historian’s minds, that whoever these Cimmerians were, they were the ancestors of a significant branch of the modern people of Europe. (See box below) Again, by applying the two basic linguistic rules mentioned previously, it may be seen that the Cimmerians were none other than the Khumri or Gomri, the lost ten tribes. 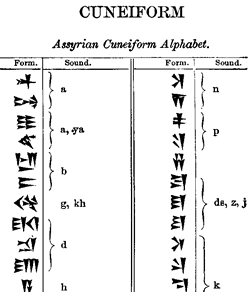 The eminent Christian historian and archaeologist, Dr. Henry Sayce, stated, “Gomer is the Gimirra of the Assyrian inscriptions, the Kimmerians of the Greek writers.”18 Many reference works associate the names Gimirrai and Cimmerians with Gomer, connecting all three together (see box at right) using the very same established linguistic rules we have presented. In fact, because the ancient Hebrew language did not contain vowels, the present rendering of “Gomer” is a later construction. 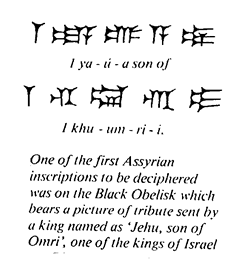 Since it is now known that the original Assyrian word for Israel was pronounced “Khumri,” and the Babylonian was “Gamir” or “Gimirrai,” it is probable that the original vowel-less Hebrew word was pronounced similar to these actual forms, as well. This information is known through the reading of ancient source documents which give us an accurate view of the 7th century, B.C. world that was not possible until recent years. The first reference (at right) tells us that the Gimirrai suddenly appeared in history during the reign of Sargon II, 722-705 B.C. He was the Assyrian king who conquered Samaria and deported the Israelites to the Assyrian-controlled province of Medo-Persia. It is amazing that historians never notice the tremendous “coincidence” of this: The first historical notice of the existence of the Gimirrai was during the same 17 years that the Israelite-Gomri-Khumri were deported and lost to history in that same province! But the connection of “Gomer” or “Gimirrai” with ancient Israel has been clouded by confusion over reference to them in the tenth chapter of Genesis, the so-called “register of nations.” In Genesis 10:2-3, we read, “The sons of Japheth; Gomer, and Magog, and Madai, and Javan, and Tubal, and Meshech, and Tiras. And the sons of Gomer; Ashkenaz, and Riphath, and Togarmah.” A literal, racial interpretation of these verses would make Gomer (or Gimir) a son of Japheth, and not of Shem as the Israelites were. But there are at least two important reasons why this is not so. First, Japheth lived at the time of the Noahic flood, which has been dated by Christian scholars to about 3400 B.C., more than 2,500 years before King Omri, who reigned about 882 to 871 B.C. As shown previously, the Israelites were called “Khumri” or “Gimirri” after King Omri; clearly, the “Gomer” in Genesis chapter ten is ages before his time! JEZREEL: “Scattered” into Assyrian dispersion 762-676 B.C. LO-RUHAMAH: “Not pitied” by God because their sins received a just recompense. LO-AMMI: “Not God’s People,” because they were divorced by Him and sent away to a far land. Scholars have traced their migration through the Caucasus Mountain region and into Europe in the early pre-Christian centuries. SONS OF THE LIVING GOD: “Christians” -Israel’s ultimate restoration would later come when they accepted Christ as Savior, becoming His Bride at the marriage supper of the lamb. One last important reference to Gomer needs to be mentioned, which appears in Ezekiel chapter 38. Gomer is listed as joining a confederacy led by “Gog, chief prince of Meschech and Tubal.” Gomer apparently does not lead this confederacy, nor are the other listed confederate nations Israelites. In addition, one should not assume that all of the lost tribes, Gomer/Gamir, are allied with Gog, but only one portion. So it is primarily a non-Israel invading force, which also includes some number of Israelites. Therefore, dispensationalists who identify Gomer as Europe may be at least partially right in that identification, because the Celtic-Cymry race did spread throughout Europe, before colonizing North America, Australia, South Africa, and other lands. But because Gog’s army invades the “mountains of Israel,” they assume that Gomer itself must not be Israelite. That assumption has little basis. Israelites have warred among themselves since the kingdom was divided into Israel and Judah after the time of Solomon, about 975 B.C. Whether the battle typified in Ezekiel is literal or allegory is impossible to predict beforehand, but that it represents to some degree yet another fratricidal war between Israelites seems obvious. One possible fulfillment was addressed in the old nineteenth-century prophecy, “George Washington’s Vision,” a prophetic vision received by America’s first President during the Revolutionary War. It speaks of a confederacy comprised of “Europe, Asia, and Africa” coming in battle against America: “Then my eyes beheld a fearful scene: From each of these countries arose thick, black clouds that were soon joined into one.” The late Professor C.A.L. Totten of Yale University wrote in the year 1898: “The third and last peril clearly indicates a future invasion of our country by the Old World. The drift of events and Bible prophecy indicate that a great combination of powers will be the actor.”25 In the prophecy, help against this peril comes in the form of divine assistance, apparently the Second Advent. The Encyclopedia Britannica article we quoted states that it is “certain” that the tribe of Gomer is identified with the Celts, Teutons, and related peoples of Europe. We have found through linguistics (the study of languages), as well as through Bible prophecy in Hoseh, that the people called Gomer or Gimir are in fact Israelites. Linguistically, Israel’s name, Khumri, is the phonetic equivalent of the European, Cymri; and Gomri/Khumri is also the consonantal equivalent to Gomer, Gimir, and Cimmiri. Therefore, if it is indeed a certainty that Gomer is found in the Europeans of today, then it is an equal certainty that those same Europeans are Israelites. It is odd that scholars so easily admit to certainty concerning the relationship between the names Gomer, Gimirrai, and Cimmeri, yet are silent concerning the name Khumri. It is never mentioned or investigated. Author and historian Geoffrey Ashe, mentioned earlier, states that it is “altogether too complicated” and “a theme for speculation only.” That argument is rather specious, since it never appears “too complicated” for them to positively link the other three names Gomer, Gimirrai, and Cimmeri, using the same rules! Mr. Ashe also speaks of “alleged linguistic coincidences” which support the Anglo-Israel view. But there is nothing either alleged or coincidental about it. The information we have presented is based upon standard, accepted grammatical rules, and the known fact that Israel was the Khumri of the ancient inscriptions. Since the name Gomri/Khumri is the consonantal equivalent of Gomer, Gimir, and Cymri, it would indeed be a strange “coincidence” if they were not identical peoples! Scholars don’t consider the identity of the latter three as coincidence, but as fact! Geoffrey Ashe, article: “Lost Tribes Of Israel,” in “The Encyclopedia of Myth and Magic,” 1995, xi:1644-1646.